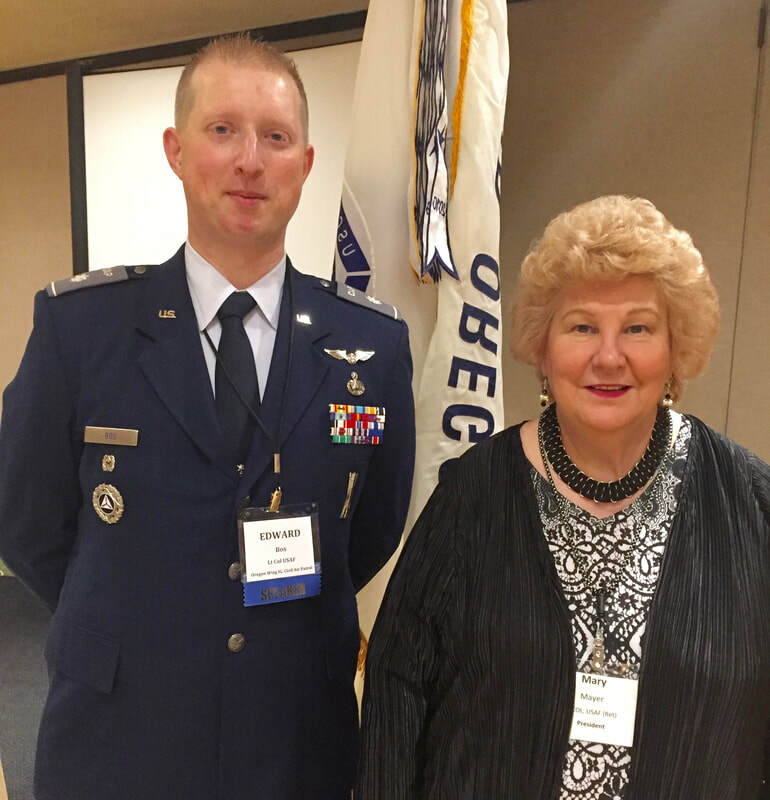 Cameron Smith, Director of the Department of Consumer and Business Services, spends a moment with Col Mary J. Mayer, USAF (Ret), President of the Chapter, at the March brunch meeting at Hayden’s Lakefront Grill in Tualatin. Smith was the keynote speaker at the brunch. 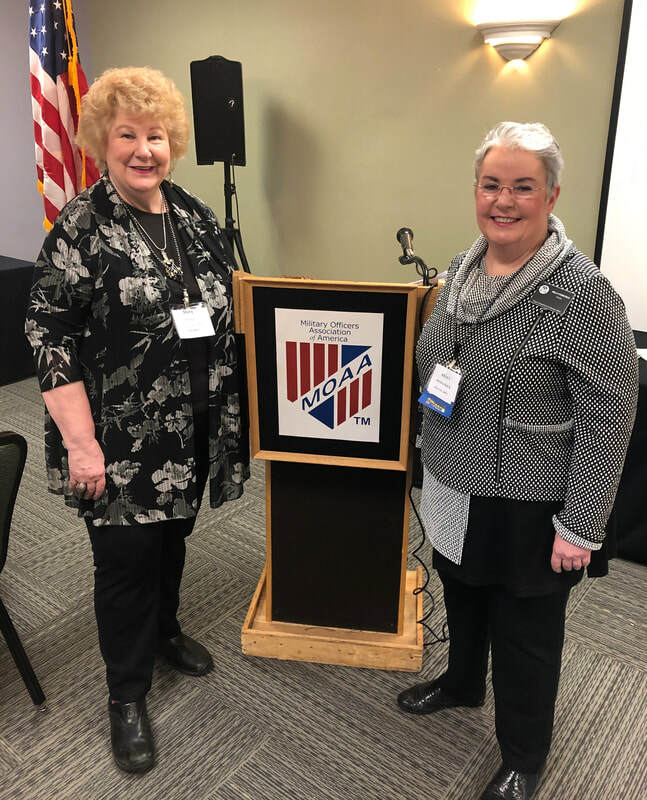 Kelly Fitzpatrick, right, the Director of the Oregon Department of Veteran Affairs, shares a moment before the February MOAA brunch meeting with Chapter President, Col Mary J. Mayer, USAF (Ret.). 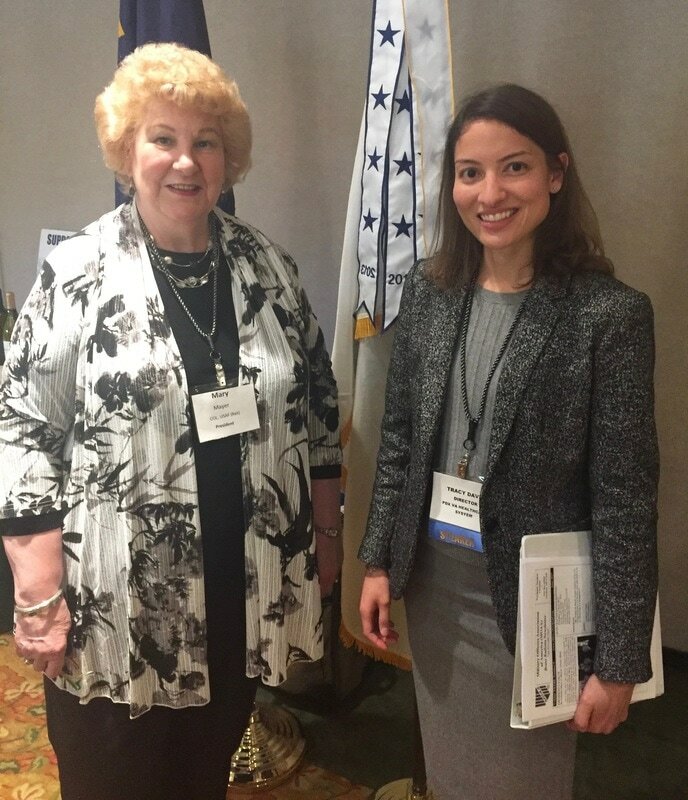 Ms Fitzpatrick spoke about veteran affairs in Oregon. The well-attended meeting was held at Hayden’s Lakefront Grill in Tualatin. 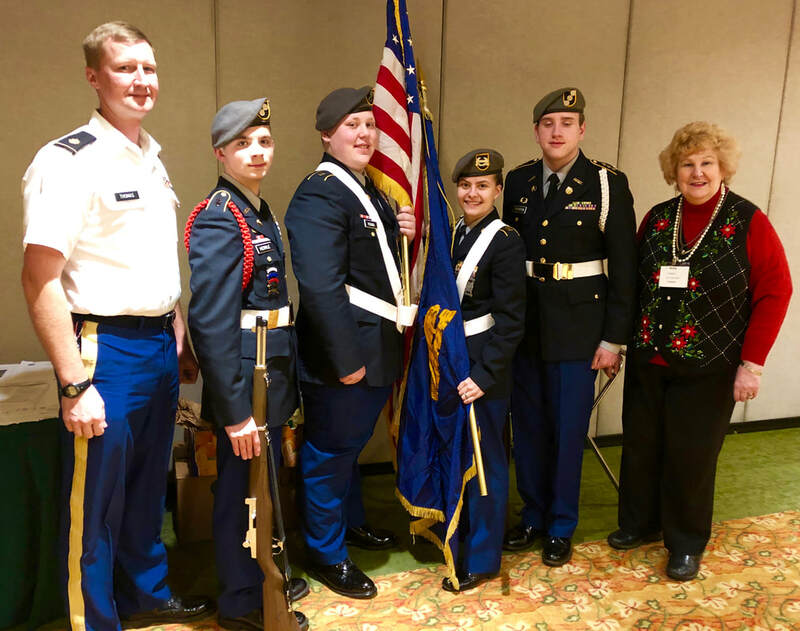 At the Chapter’s annual Christmas gathering in December at the Monarch Hotel in Clackamas, Cadet members of the JROTC program at Oregon City High School pause for a photo with their faculty commander and with Col Mary J. Mayer, USAF (Ret. 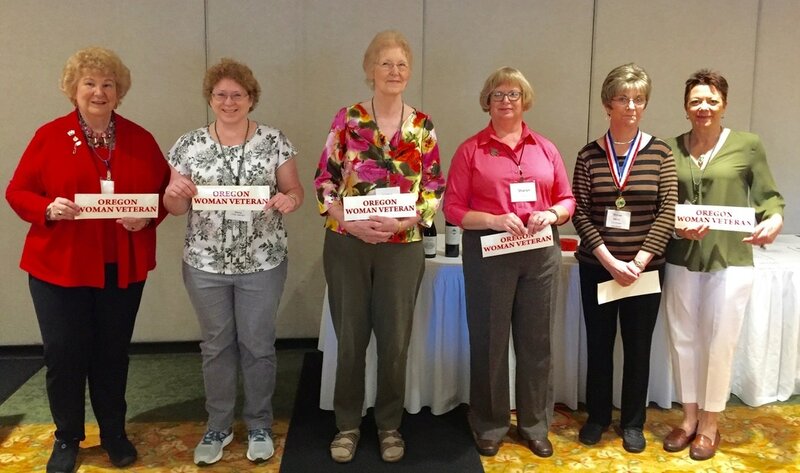 ), Chapter President. The well-attended affair included music from the John Bennett Trio, raffles and dancing and a tribute to the fallen at Pearl Harbor on Dec. 7, 1941. 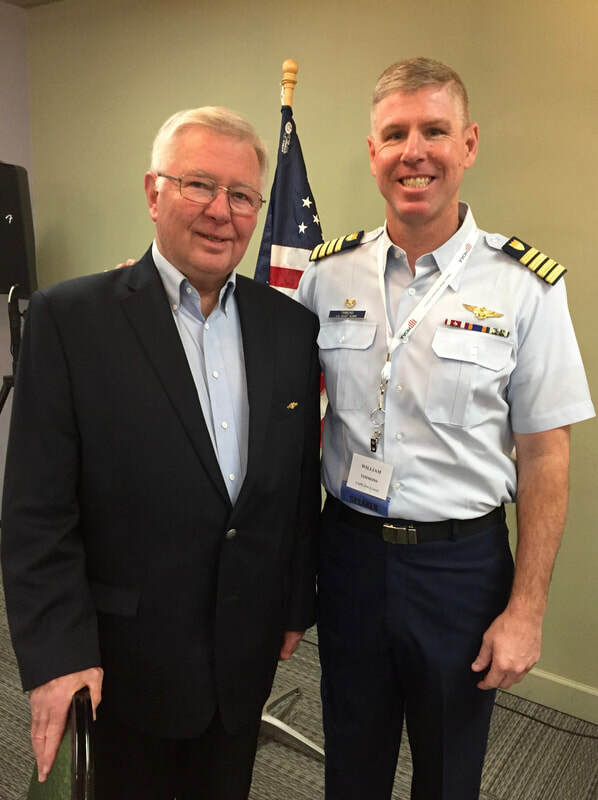 ​Guest speaker Ben Berry, left, founder and CEO of the Airship Technology Group in Lake Oswego, and CAPT Larry Roberts, USNR (Ret), Chapter First Vice President, share a moment before the well-attended November brunch meeting at Hayden’s Lakefront Grill in Tualatin. 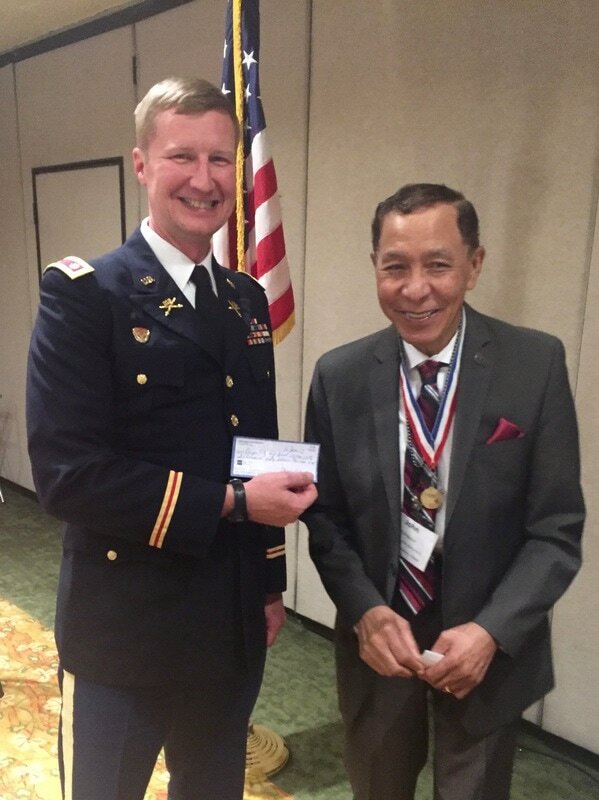 Berry spoke about the Tuskegee Airmen and his father, “Flaps” Berry, a Tuskegee Airman. 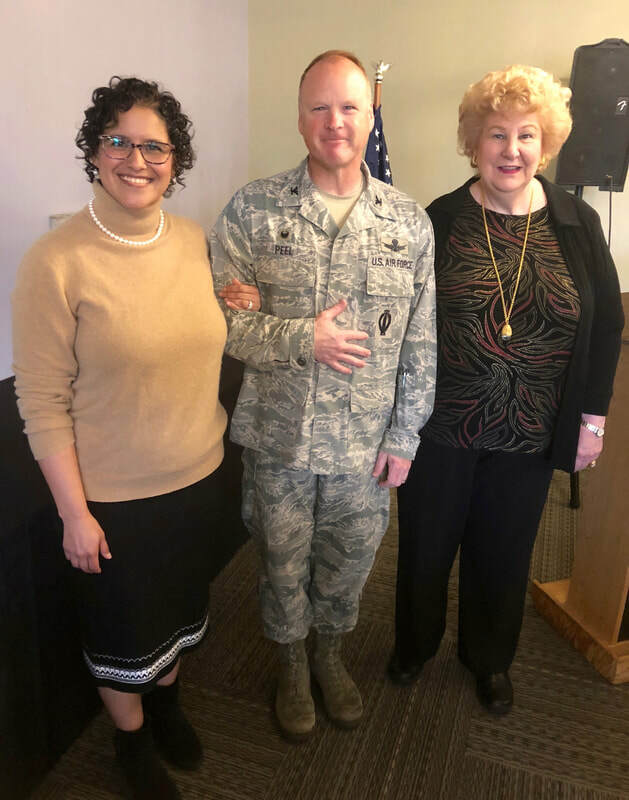 Keynote speaker Col Scott D. Peel, USAF, his fiancé, Emily Barton (left), and Chapter President Col Mary J. Mayer, USAF (Ret), share a moment before the October meeting at Hayden’s Lakefront Grill in Tualatin. Col Peel gave an update on space programs. 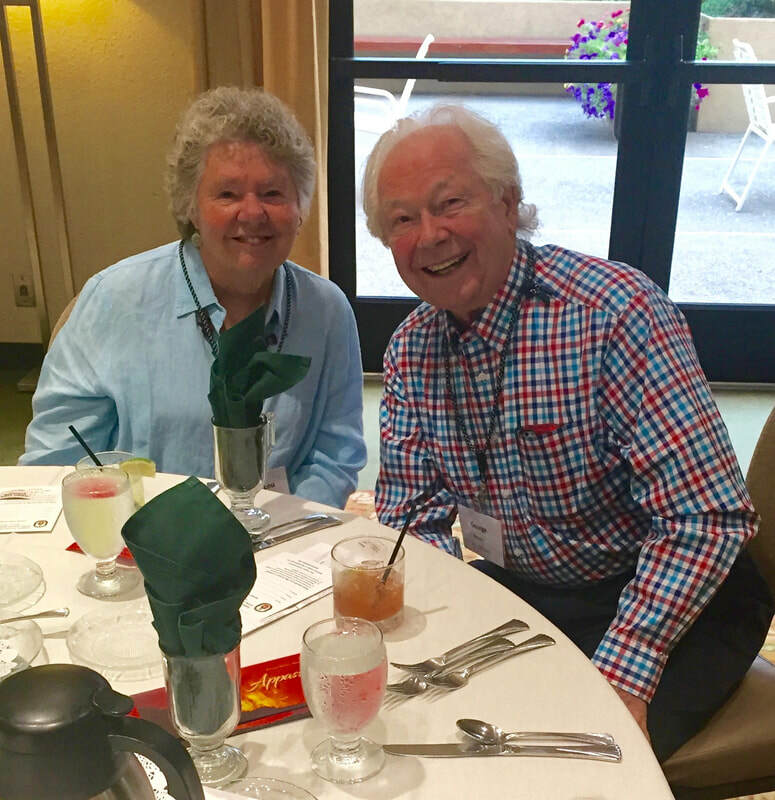 USMC Maj Gen Christopher Owens (Ret) and Col Mary J. Mayer, USAF (Ret), President of the Portland Chapter, share a moment before the well-attended September meeting at the Monarch Hotel in Clackamas. 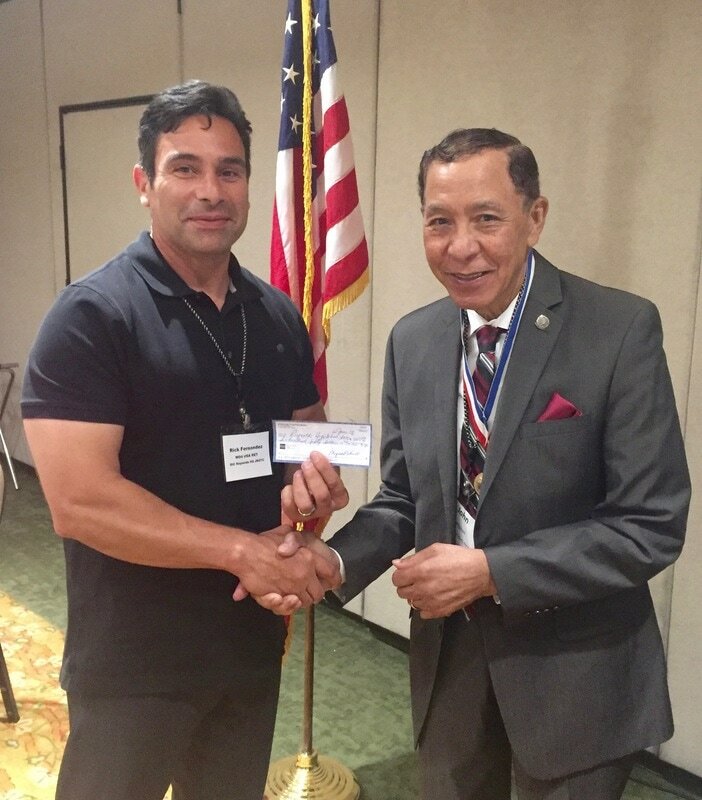 Maj Gen Owens was keynote speaker and talked about “expeditionary warfare” in the Navy. 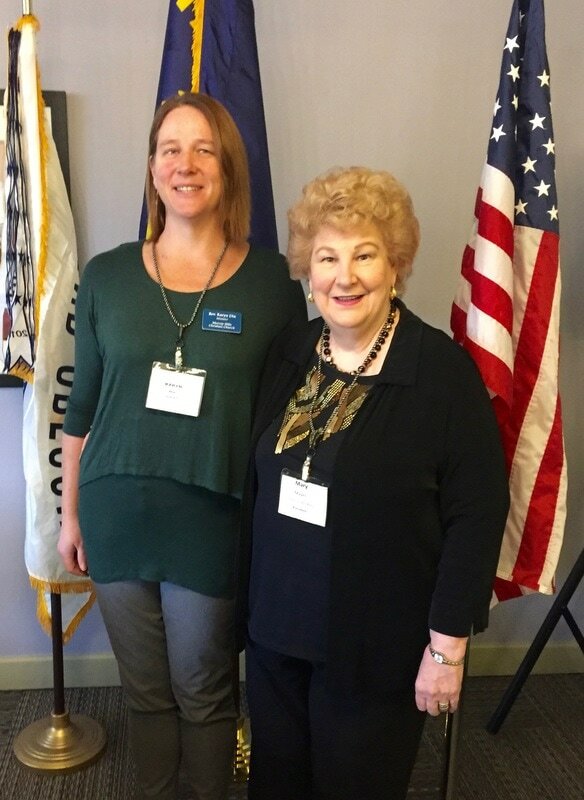 ​Major Kelly Fitzpatrick, USA (Ret), right, spends a moment before the Portland Chapter meeting with Col Mary J. Mayer, USAF (Ret), Chapter President. 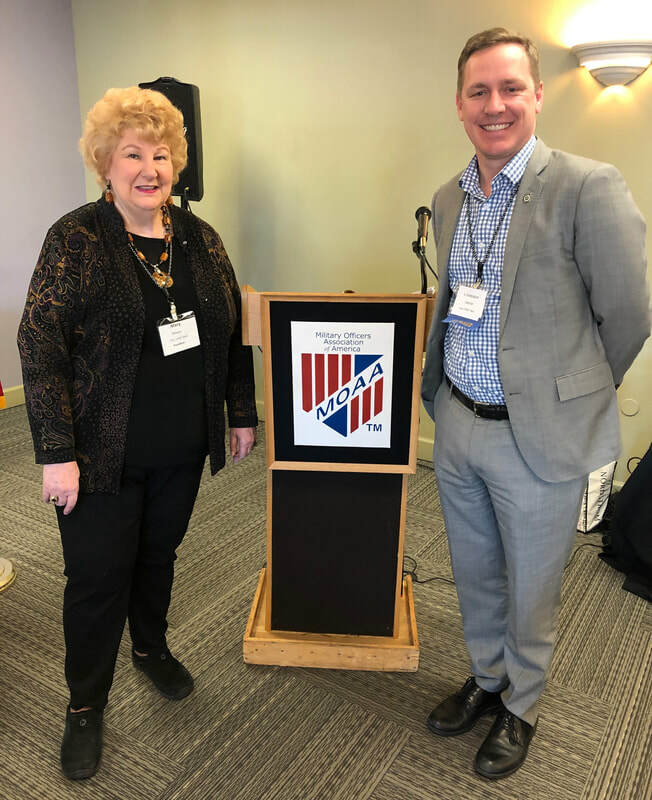 Fitzpatrick, Military and Veterans Constituent Services Representative in the office of Sen. Jeff Merkley, D-OR, spoke on “Perspectives on the Federal Government” at a well-attended brunch meeting March 3 at Hayden’s Lakefront Grill in Tualatin. 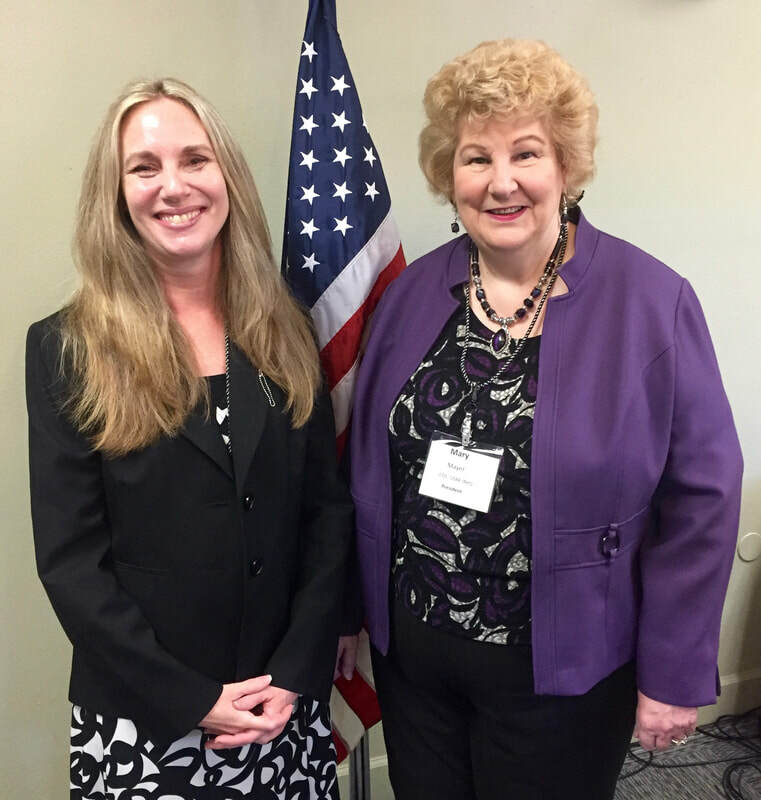 ​The newly appointed Acting Director of the Oregon Department of Veterans Affairs, Sheronne Blasi, left, spoke to members of the Portland Chapter of MOAA, at the February brunch meeting at Hayden’s Lakefront Grill in Tualatin, about the status of veteran affairs in Oregon and about the legislative cycle that begins shortly. 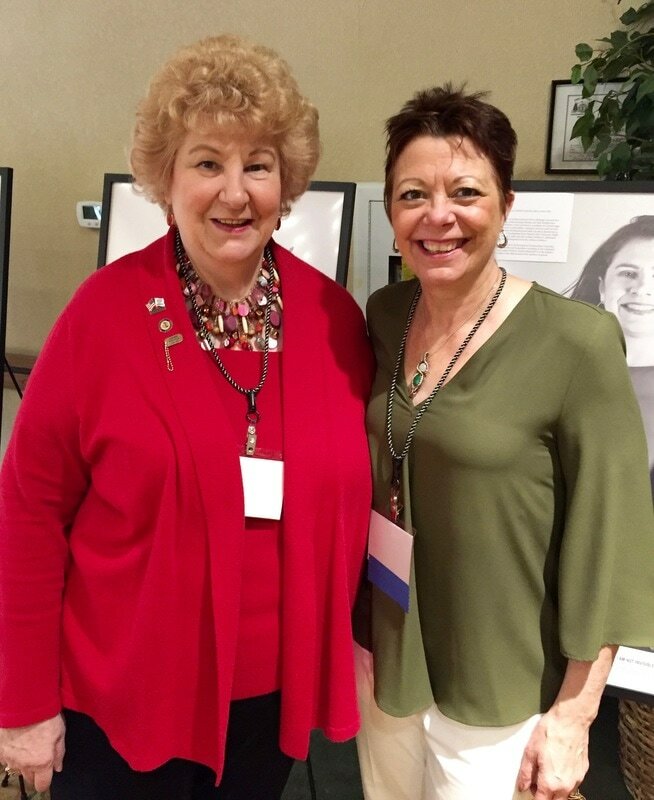 With her here is Col Mary J. Mayer, USAF (Ret), chapter President. CAPT Larry Roberts, USNR (Ret. 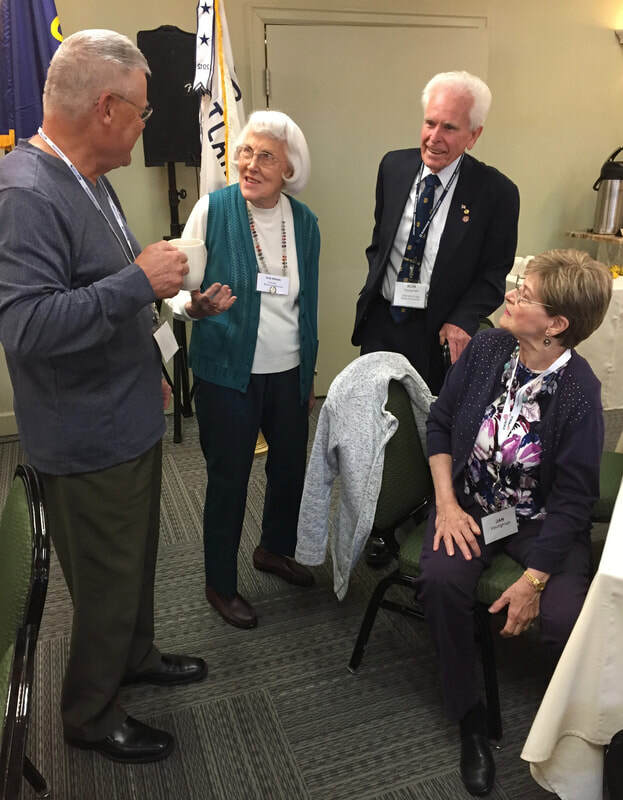 ), left, Chapter First Vice President, spends a moment at the Chapter brunch meeting in November at Hayden’s Lakefront Grill in Tualatin with the keynote speaker, CAPT William R. Timmons, USCG, the Sector Commander of Coast Guard Sector Columbia River. CAPT Timmons’ talk was on “Reflections on Command.” He discussed his unit’s mission and talked about the daily incidents that come up. ​Mr. 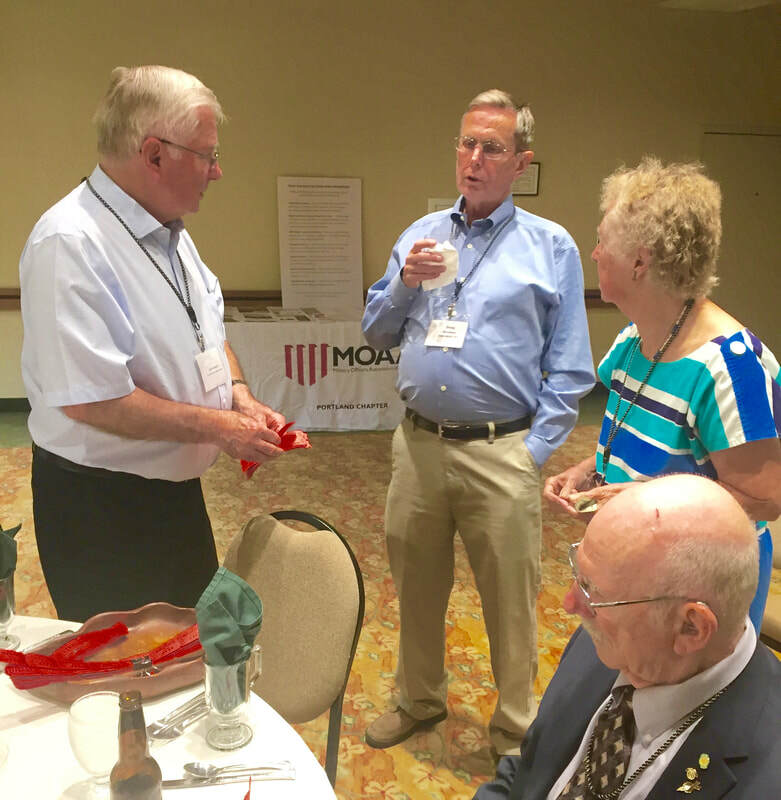 Gordy Molitor, keynote speaker, left, spends a moment with MOAA Chapter President Col Mary J. Mayer, USAF Ret., before the September dinner meeting at the Monarch Hotel in Clackamas. Mr. Molitor talked about climate change and its impact on the U.S. military. He said much more attention needs to be paid to climate change by the military. 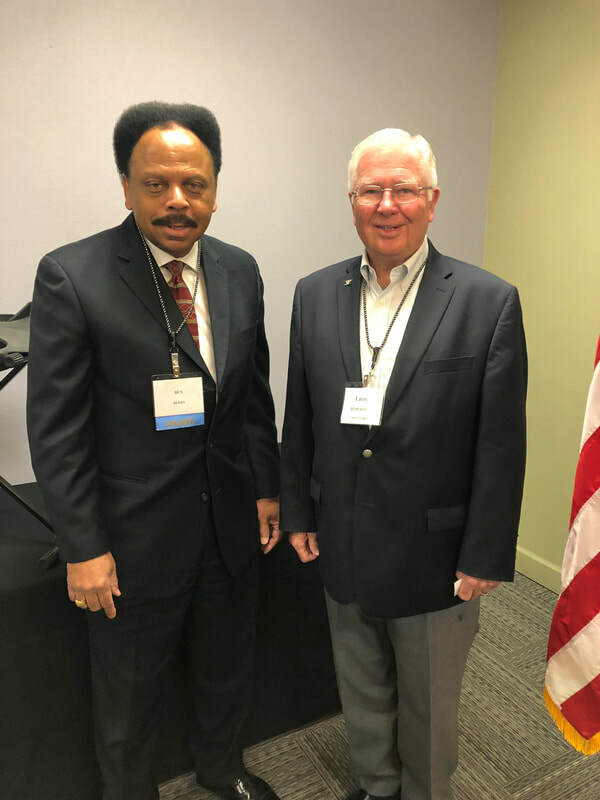 He is retired from CARE, the international relief and development organization, and since has volunteered with a number of groups and serves on the board of Our Climate and Solar Oregon. 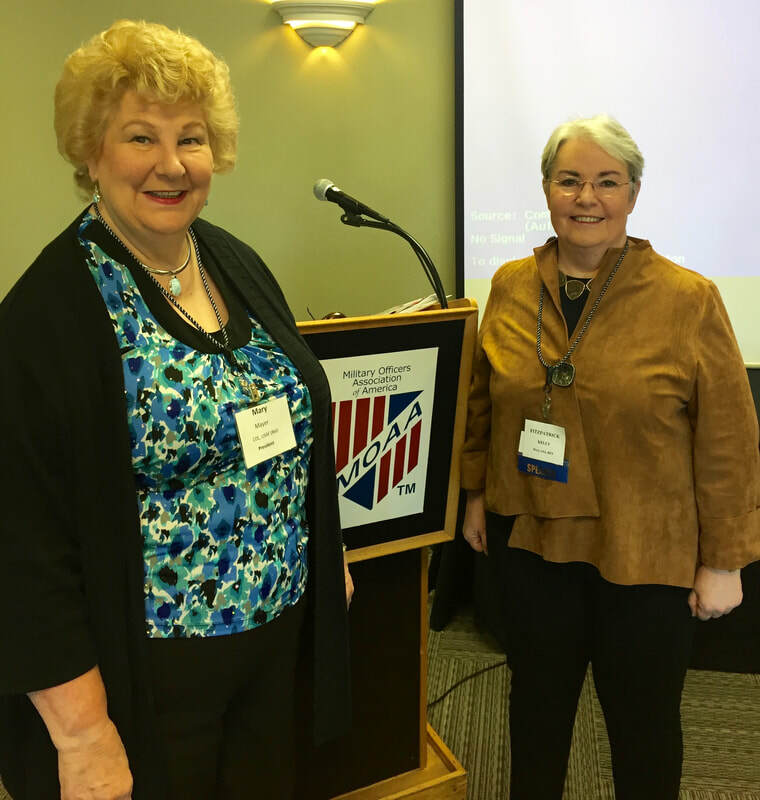 Tracye B. Davis, Deputy Director of the Portland VA Health Care System, right, and Chapter President Mary J. Mayer, USAF (Ret), spend a moment together before the June meeting of the Portland Chapter at the Monarch Hotel in Clackamas. Ms Davis talked about “VA Initiatives” and gave a very informative talk on what’s going on at the Portland VA. The meeting was well attended. 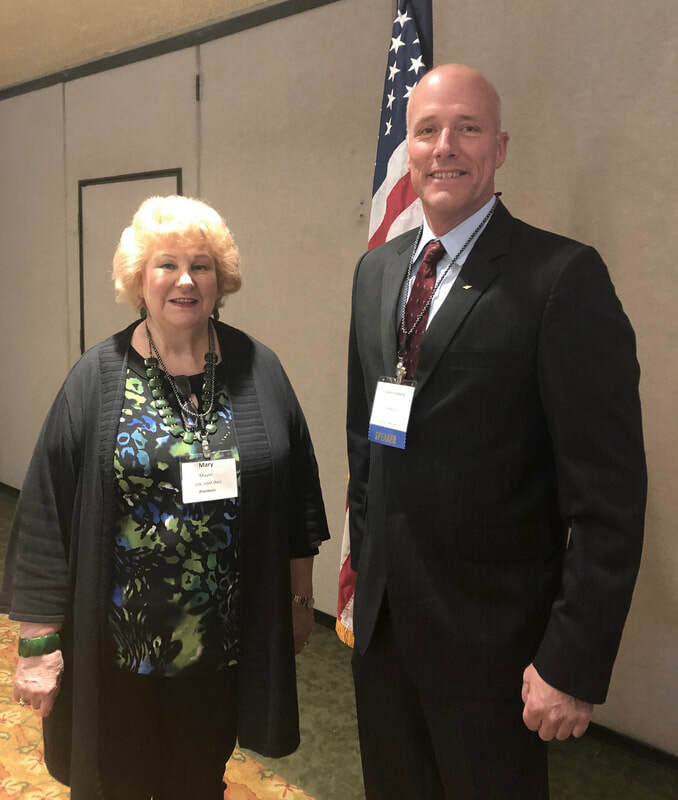 Captain Matthew Martinson, P.E., Director, Division of Sanitation Facilities Construction at the Portland office of the Indian Health Service, was the April keynote speaker at the Portland Chapter meeting at the Monarch Hotel in Clackamas. 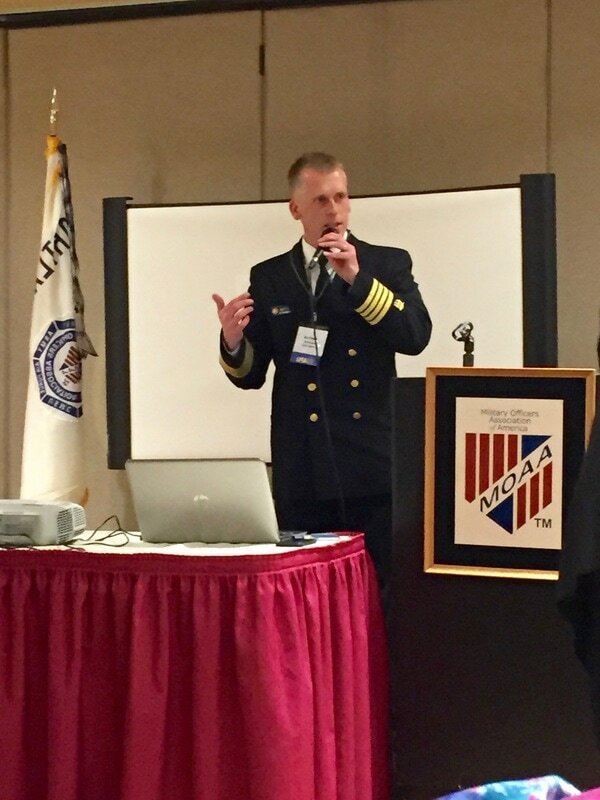 Captain Martinson talked about the Indian Health Service and its projects. 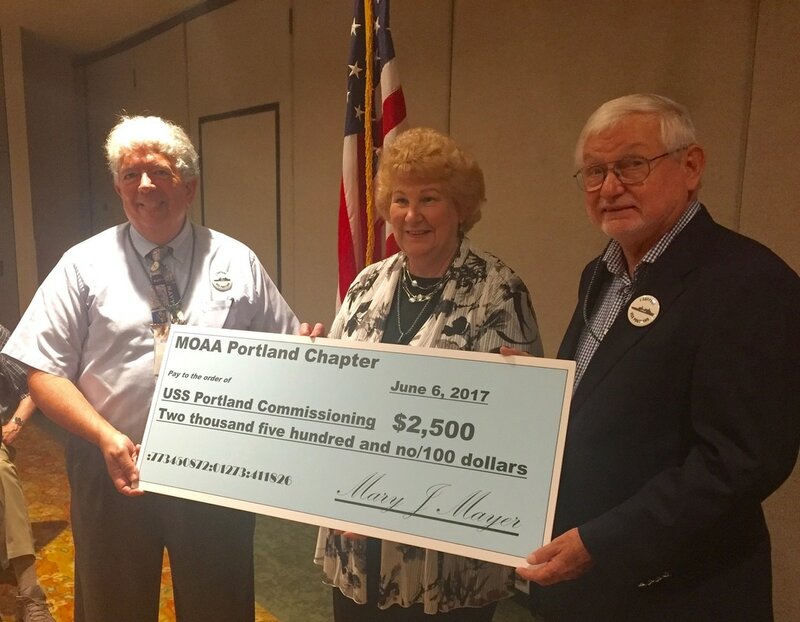 Attendees at an MOAA Oregon State Council of Chapters meeting in Portland in May spend a moment for a photo shoot. 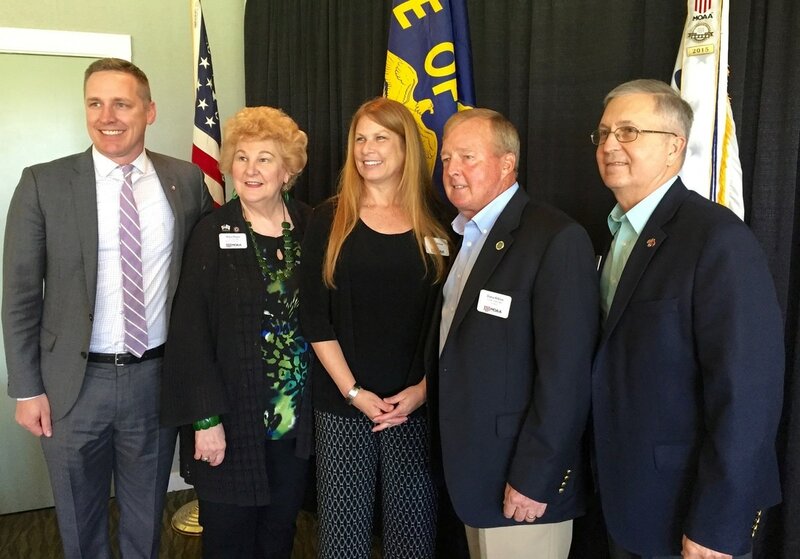 From left, Cameron Smith, Director of the Oregon Department of Veterans' Affairs; Col Mary J. Mayer, USAF (Ret), President of the MOAA Portland Chapter and member of the MOAA National Board of Directors; Mrs. Laura Atkins; Lt Gen Dana Atkins, USAF (Ret), President/CEO of MOAA; and BG Dennis Merrill, the President of the Oregon State Council of Chapters. 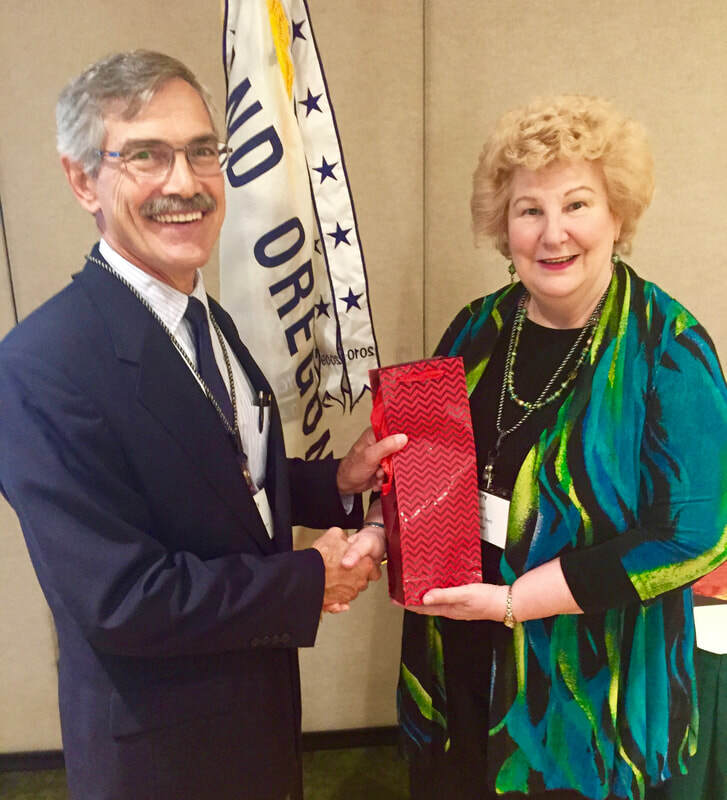 Lt Gen Atkins was in Portland to receive an honorary doctorate from his alma mater, the University of Portland, and was invited by the Oregon State Council of Chapters to speak to the group at a special Council Meeting convened for the occasion. 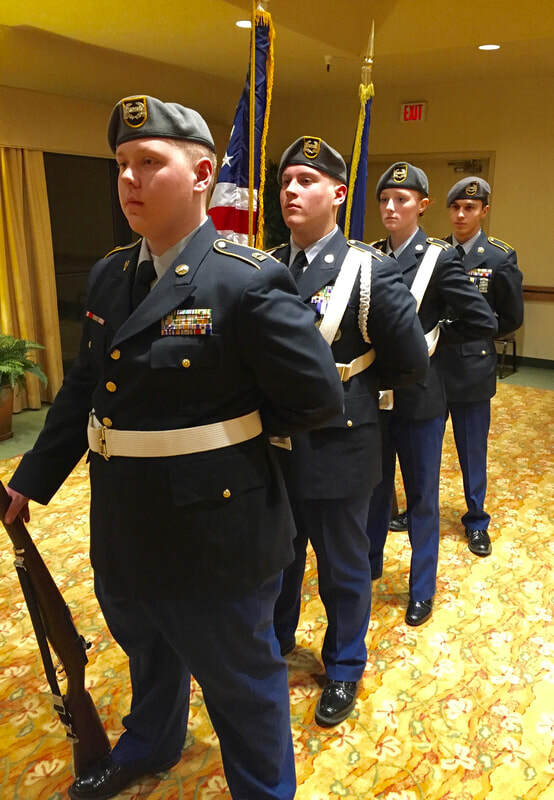 It also dovetailed with the board meeting of the Portland Chapter, whose members heard the general speak. The early morning breakfast event was well attended. The general talked about MOAA nationally and the strengths of the organization now and going forward. 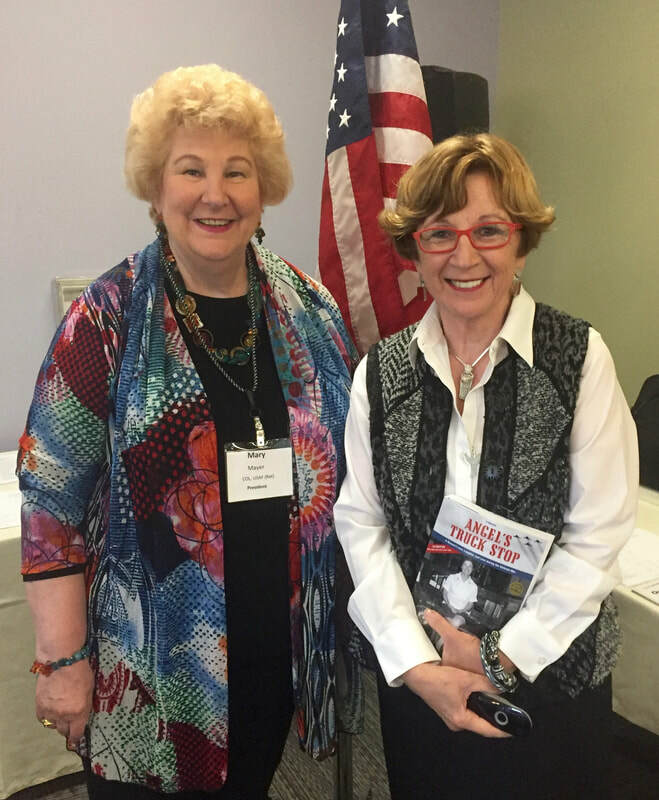 Col Mary J. Mayer, USAF (Ret), right, and Rev. Karyn Dix, Minister at Murray Hills Christian Church in Beaverton, share a moment before the March 4 brunch meeting of the Portland Chapter at Hayden’s Lakefront Grill in Tulatin. Rev. Dix spoke on “Moral Injury” to the well-attended brunch gathering.